The Lower Modernisms – 043. 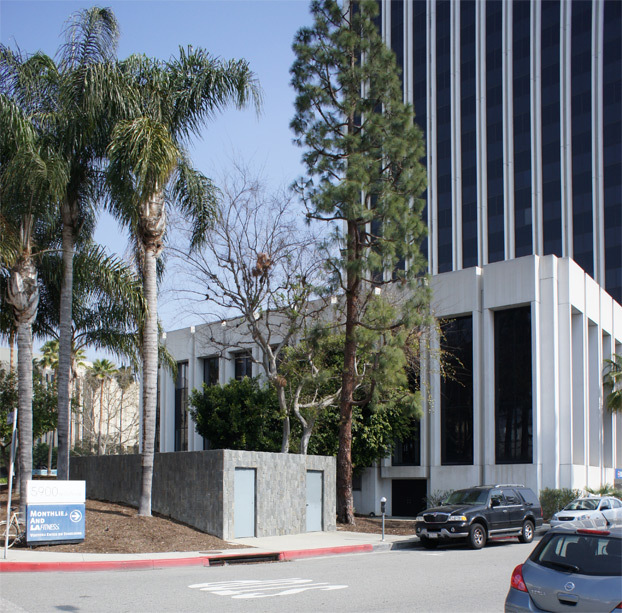 Lomo Featured Project: the Perfect Building behind 5900 Wilshire Boulevard. Lomo Styles: the Perfect Building. March 3, 2012 by James Black. Entirely clad in slate and half-buried in the mounded landscape, this outbuilding has a Modernist integrity and rigor that puts the 1969 tower to shame. A theoretical Perfect Building is one that approaches Platonic perfection by having the fewest number of distinct details. A hypothetical Most Perfect Building would be a sphere of homogeneous material of constant thickness with no openings of any kind; any section cut through it would be identical. In practice, the Perfect Building is one which is detailed to appear like a Platonic ideal. Belying the nature of constructed buildings as assemblies of multiple parts, with walls distinct from roofs and with cladding distinct from structure, a Perfect Building inspires the beholder to interpret it as a pure Platonic shape. Such buildings are the ethical acme at the end of the pathway of reasoning that equates Ornament with Crime. 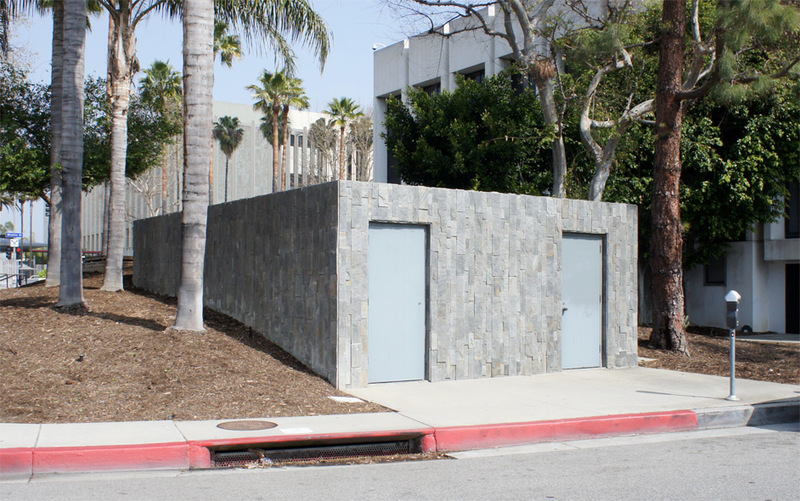 The Perfect Building at 5900 Wilshire seeks anonymity. You are not supposed to notice it. It reads as a pure box of tiled stone. Aside from the mandatory concession to having those two doors, it has been carefully detailed to maintain this illusion of pure boxness. 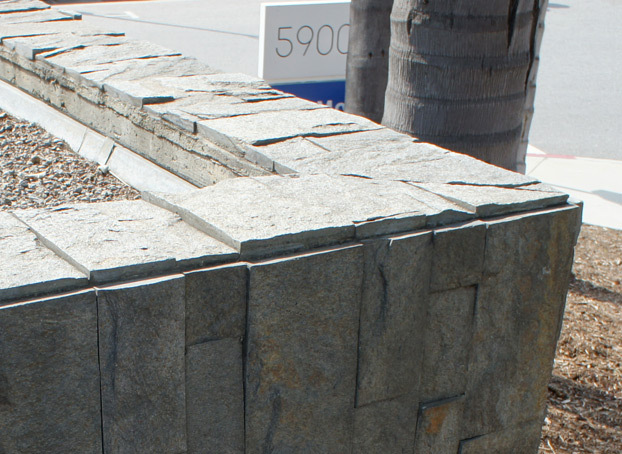 The slate tiles run straight down to the ground with no material transition. There is no cap flashing over the top of the walls to express the distinction between roof and wall; this effect is achieved at some cost, as it is invariably more difficult or costly to build a properly watertight building that achieves such graciously minimalist effects. What shoves this little building down into the family of the Lower Modernisms is its programme – an enclosure housing nothing but mechanical equipment does not rise to the accepted threshold to be considered as Architecture per se. 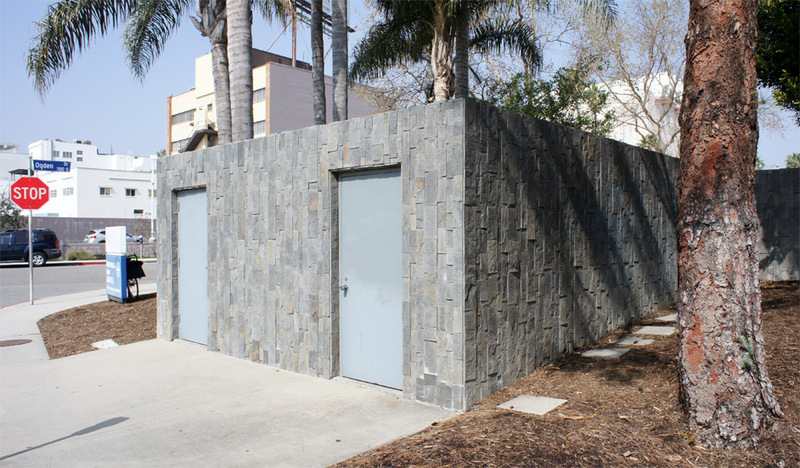 Recalling the argument made in post 003 about the Huntington Beach Central Park Washroom Pavilion, it is paradoxically this freedom from being Architecture that permits the building to be so rigorous. The functional concerns over water intrusion that usually necessitate ugly cap flashings over the tops of parapets are here relaxed, allowing greater aesthetic control on the part of the designer. Nothing but slate is seen in its silhouette against the sky, and even the opening around the door frames has been clad in the same slate tile, reinforcing our perception of the thickness and mass of this stone box. 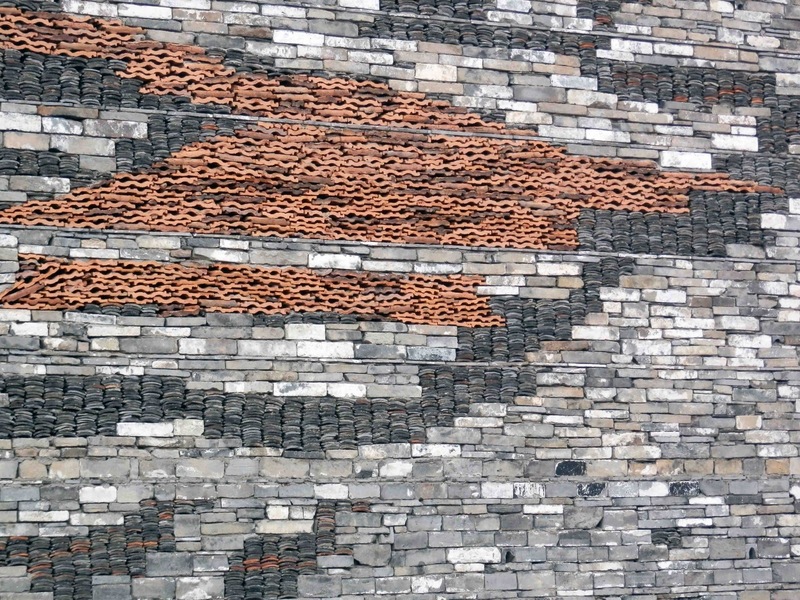 For all we know from looking at it, the walls might be perversely constructed of nothing but a stack of slate tiles and blocks, like an orderly alternative version of the informal walls designed by newly minted Pritzker Laureate Wang Shu. Climbing around to the top feels like cheating, but exposes how the effect was achieved. 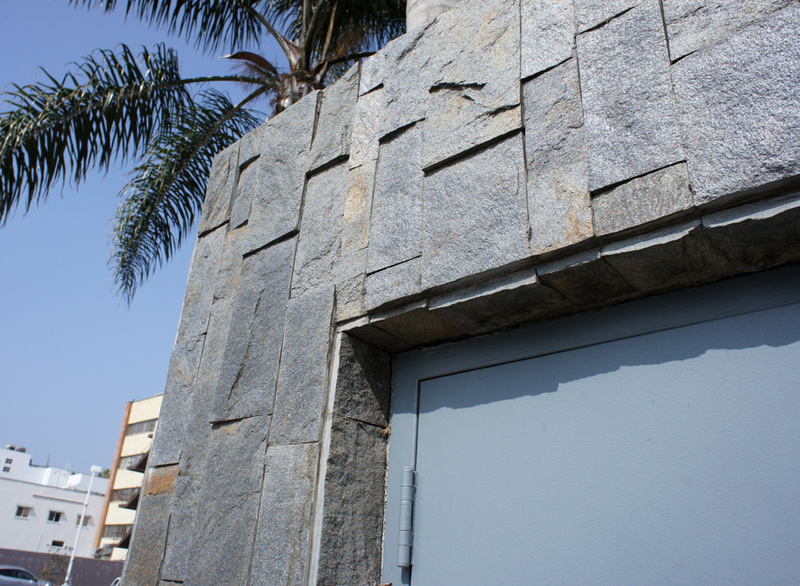 The walls are of poured-in-place concrete, the slate tiles adhered to it with a cementitious material. Matching tiles are applied even over the top of the parapet. The concrete is exposed at the inner face of the parapet, with the roofing terminated under a sheetmetal counterflashing let into a continuous reglet in the concrete. Had the slate tile been left off it and the poured-in-place concrete exposed and expressed with similar rigor, this would have been a better Theoretical Perfect Building, but possibly a lesser Practical Perfect Building, as the slate tile lends an abstract quality to its appearance. William Pereira would abhor the suggestion that this little building was his finest moment. Where is your detail sketch?